Saul, from the tribe of Benjamin, was the first king of Israel. His character is in part illustrated by the fierce, wayward, fitful nature of the tribe, and in part accounted for by the struggle between the old and new systems in which he found himself involved. To this we must add a tendancy towards madness, which broke out in violent frenzy at times, leaving him with long lucid intervals. He was remarkable for his strength and activity and for his gigantic stature, taller by head and shoulders than the rest of the people. His birthplace is not expressly mentioned, but Zelah in Benjamin was probably his native village. 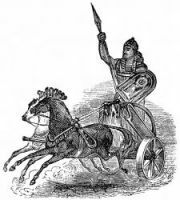 His father, Kish, was a powerful and wealthy chief, though the family to which he belonged was of little importance. A portion of Kish's property consisted of a drove of asses. Saul was sent to find the asses, which had gone astray on the mountains. During this adventure, Saul met with Samuel for the first time at his home in Ramah, five miles north of Jerusalem. A divine intimation had made known to Samuel the approach of Saul, whom he treated with special favor, and the next morning descending with him to the skirts of the town, Samuel poured the consecrated oil over Saul's head, and with a kiss of salutation, announced to him that he was to be the ruler of the nation. At Mizpeh, lots were cast to find the tribe and family which was to produce the king, and Saul was found hidden in the circle of baggage which surrounded the encampment. 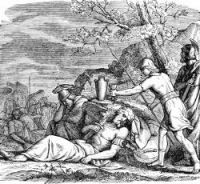 Returning to Gibeah, apparently to private life, Saul heard the threat issued by Nahash, king of Ammon, against Jabesh-gilead. 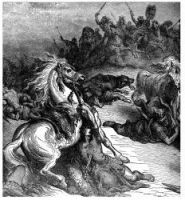 Saul speedily collected an army, and Jabesh was rescued. The effect was instantaneous on the people, and the monarch was inaugurated at Gigal. This series of images of Saul is from my collection of antique Bible books. Feel free to use these pictures of Saul in your artwork. Click on the Saul illustrations below to see more details about saving a free Saul image or about purchasing the images of Saul at a higher resolution.